Once upon a time, 1986 Donruss Baseball was home to a $100 card. 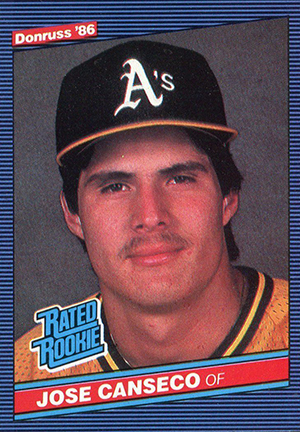 Before you go digging out your treasured Jose Canseco rookie and plan to fund a vacation with it, you might want to think twice. 1986 Donruss Baseball doesn't have a $100 card anymore. Not even close. But that doesn't mean it doesn't have cards worth tracking down and having a little fun with. 1986 Donruss Baseball has a 660-card checklist. It starts with 26 painted Diamond Kings, spotlighting a key player for each franchise. They're followed by Rated Rookies, which spotlight key young players. Even though it's not as valuable as it once was, Canseco is one of them. It's one of the more iconic cards of the decade. It just so happened that the outfielder's career derailed in a big way and there is much more supply than demand now. Other notable Rated Rookies include Fred McGriff, Paul O'Neill and Andres Galarraga. 1986 Donruss Baseball cards have a blue background that have black pinstripes. The look is almost like a set of thing horizontal blinds if you look closely. Images have a diagonal top and bottom with a parallel name plate at the bottom of the photo. Backs have the trademark boxy design that Donruss used throughout much of the 1980s. They include vitals, stats from the previous five years and career numbers, a brief bio and contract status. It's always interesting to read a player's full name on the backs. Every pack comes with three pieces to a Hank Aaron puzzle. Boxes have a sheet of four cards attached to the bottom. All boxes have the same panel, which includes Kirk Gibson, Willie Hernandez, Doug DeCinces and a card of the completed Hank Aaron puzzle. Numbering continues from the box bottom cards issued with 1985 Donruss Baseball. 1981 1982 1985 1986 DONRUSS COMPLETE BASEBALL SETS*NICE!! 660 cards. Shop for base sets on eBay. Numbering continues from 1985 Donruss Baseball. Attached to boxes as an uncut sheet.